Today I am here with Peanut Rice. This South Indian style variety rice is easy to make and can be prepared in a jiffy, which makes it perfect for packing lunch box. First peanut spice powder is prepared and then it is mixed with cooked rice. So simple to prepare and it tastes delicious. It is vegan and gluten free too. I came across this recipe in Sangee's site couple of years ago. Since then have tried is so many times and tweaked the recipe to suit our family's taste buds. How to clean Prawns / Shrimps ? Today I am here with a video tutorial of how to clean prawns / shrimps to prepare them for cooking. There are two veins that run in prawns. But they are not actually veins. One in the back of the prawn is the digestive tract, it is dark in colour. The other in the bottom part is actually the nervous system. Some believe that it is not necessary to remove these veins. But the digestive tract contains the food the prawn / shrimp is digesting and it might not taste very pleasant. Couple of times, I had prawns in restaurant and I immediately developed allergic reaction. So I never dared to eat outside / cook at home until one day Hubby took up the task of cleaning prawns properly. Then when I cooked it and I never got any allergic reaction. From then, Hubby does the cleaning while I cook. It is with his help, I shot this video. 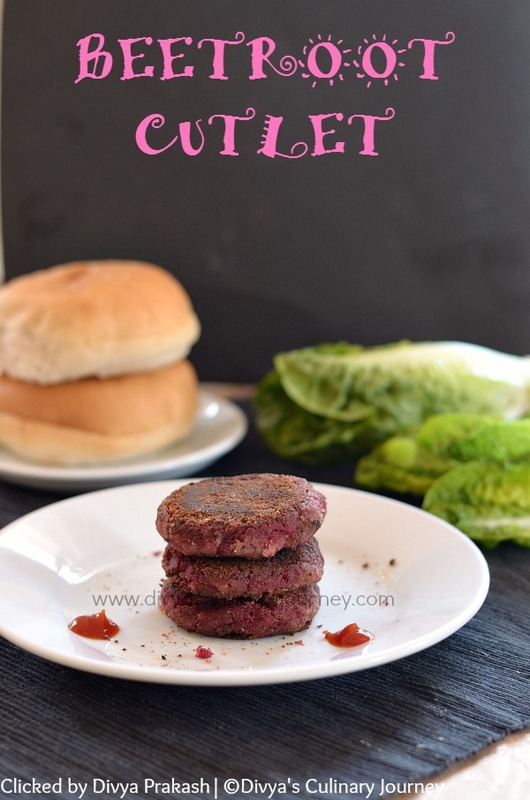 Today I am here with Beetroot Cutlet Recipe. I have prepared these cutlets long ago and they have been in my drafts for really long time. One after the other I was posting other recipes, so this post was waiting for its turn. Finally, today the day has come to publish this post. From today Easter holidays starts and kids are going to be at home for couple of weeks and I am not sure if I will get time for blogging. I may not completely ignore the blog, but definitely the time I spend for it will be less. This may affect the number of recipes I post here too. Let us see how the vacation goes. 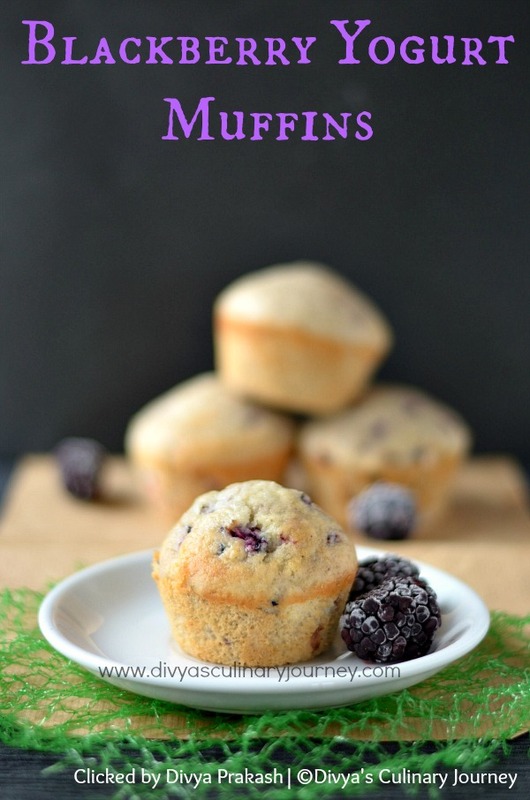 Today I am here with blackberry yogurt muffins. My hubby got blackberries from super market. Though I have always wanted to try blackberries, when he actually got them, I was reluctant to eat them as is. I always resort to baking muffins, when I don't know what to do with the fruit(let it be any fruit). So this time again, I decided to bake muffins with blackberries. I baked these muffins using yogurt and without using butter. They came out so soft and moist that my kids loved it. Today I am here with Kuthiraivali Kuzhi Paniyaram. Kuthiraivali is known as Barnyard millet in English and Jhangora in Hindi. I made Idli batter using kuthiraivali rice few days back, with the left over batter made this spicy paniyaram. This paniyaram was crispy on the outside and soft on the inside and was perfect, just the way a paniyaram has to be. Also since it is made of kuthiraivali, it is healthy too. 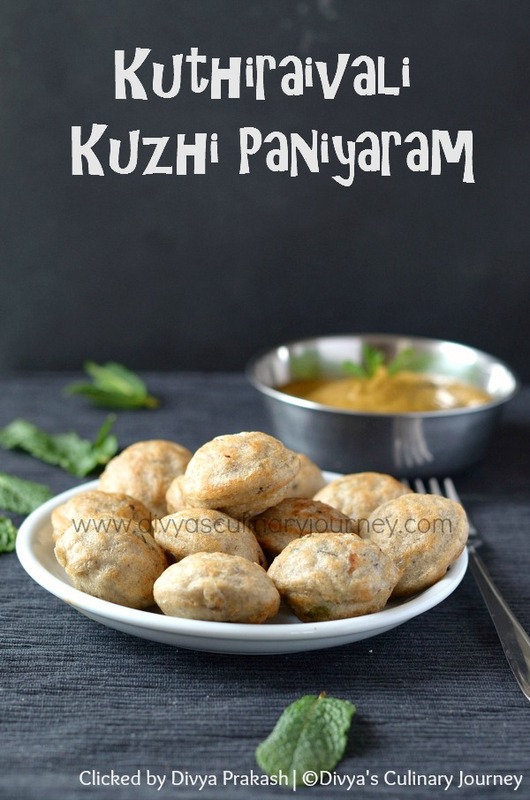 So when you are looking for a healthy alternative you can try this KUTHIRAIVALI IDLI BATTER and when it is fresh try idli, then when it is couple of days old, try this paniyaram. Today I am here with Mint Chutney recipe. This mint chutney is made with onion and tomato. 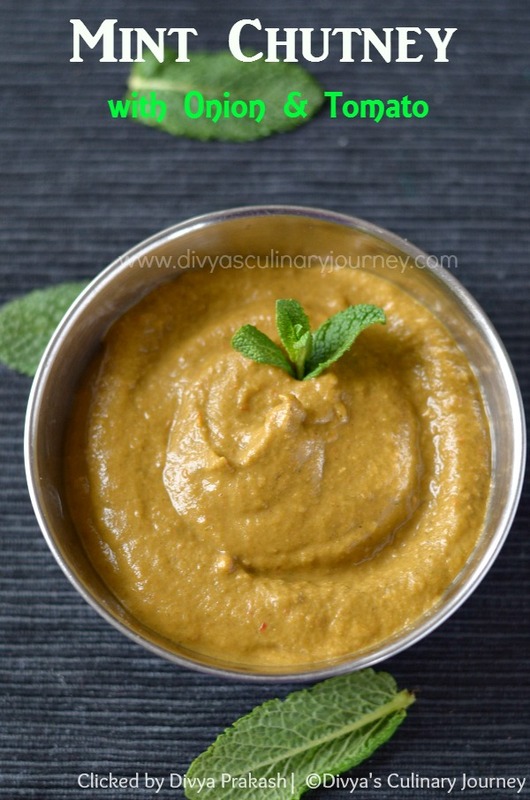 This spicy chutney is perfect with idli, dosa or paniyaram. If there are leftovers, I use them as spread for sandwich too. Today I am here with beetroot chutney. This tasty chutney is so versatile that it can be had with rice, or as a side dish for idli or dosa, or as a spread in sandwich. This can also be used like a pesto and can be mixed with pasta and had. I came across this recipe in a FB group called Flavours from kitchen where it was posted by a member, Gomu Karthi. She is a active member there and everyday she posts delicious and healthy recipes in the group. 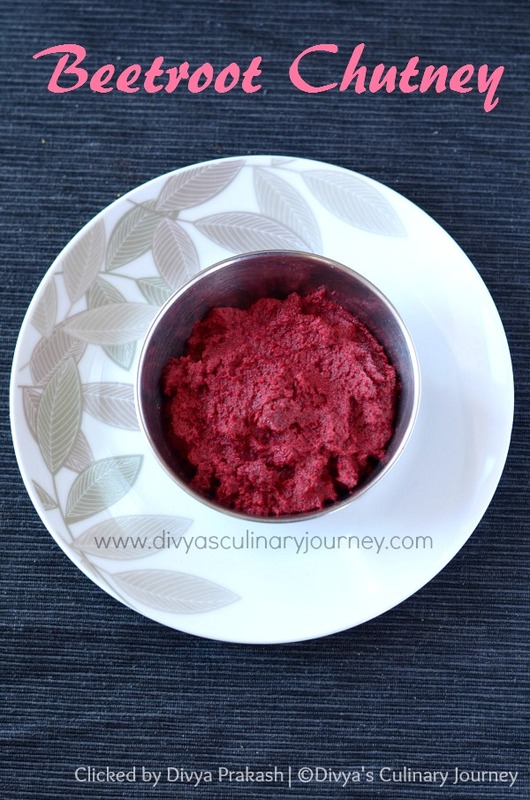 One day she posted a wonderful lunch spread with this beetroot chutney. I requested for the recipe and she shared it immediately. I tried the chutney yesterday and loved it so much. It was so delicious. I had made it as an accompaniment for rice and rasam. But for lunch, mixed it with rice along with some sesame oil and had it. It was yum! Morning I used the same chutney as a spread for sandwich. Hubby loved it. 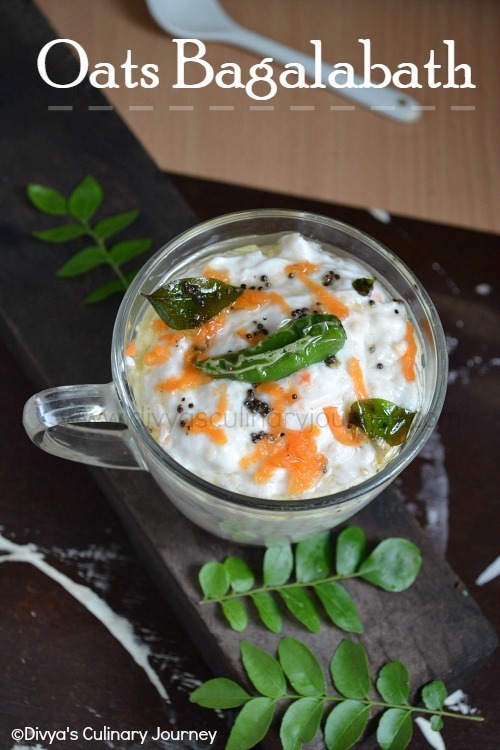 This chutney will be great with idli, dosa too. When this chutney can be mixed with rice, why cant it be mixed with pasta? It would be great too. I will have to try this another time and am sure kids will love it. Another way to sneak in beets in their diet! Today I am here with banana pancakes recipe. 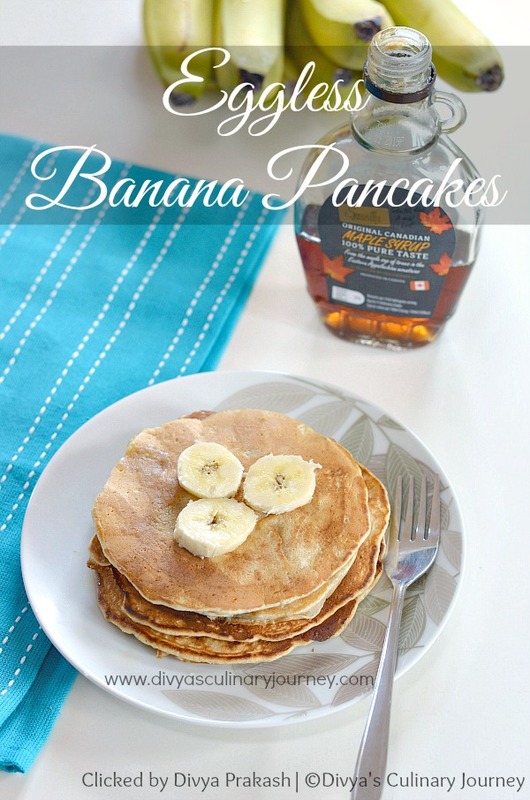 These soft and fluffy pancakes are made with ripe bananas and are egg free. Usually I make pancakes for Sunday breakfast. There were few ripe bananas lying in the fruit basket, I thought will bake some muffins as usual but didn't find time for baking at all. So this Sunday, I used them to make pancakes. I wanted to try the egg less version of banana pancakes and it came out so delicious and my kids loved it. I served the pancakes with maple syrup. Today I am here with Kuthiraivali Idli. Kuthiraivali is known as Barnyard millet in English and Jhangora in Hindi. We all love idli and make it often at home. But I have been experimenting with millets a lot lately and tried making idli using barnyard millet and it came out very well. 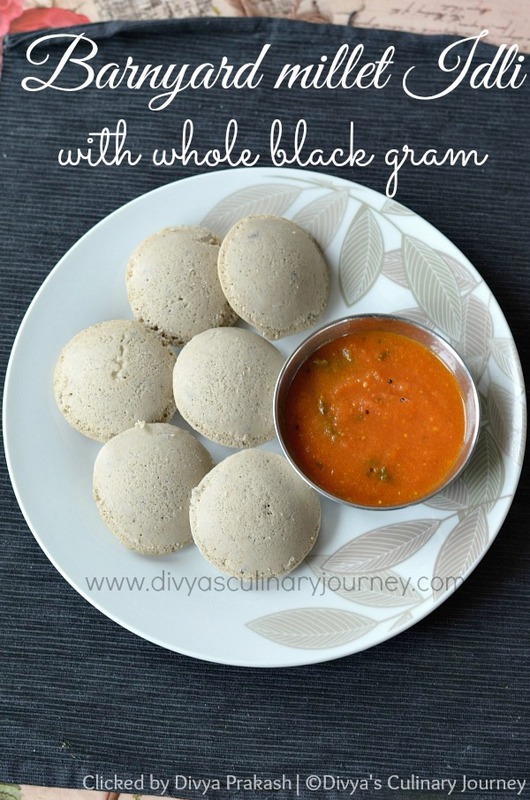 Instead of regular idli rice, I used Kuthiraivali rice and instead of de-skinned urad dal I used whole black gram. Idli tasted similar to regular idli, except for the difference in colour because of using whole urad dal (with skin). Today I am here with Kothamalli Rice Recipe. Kothamalli is nothing but fresh coriander leaves / Cilantro. 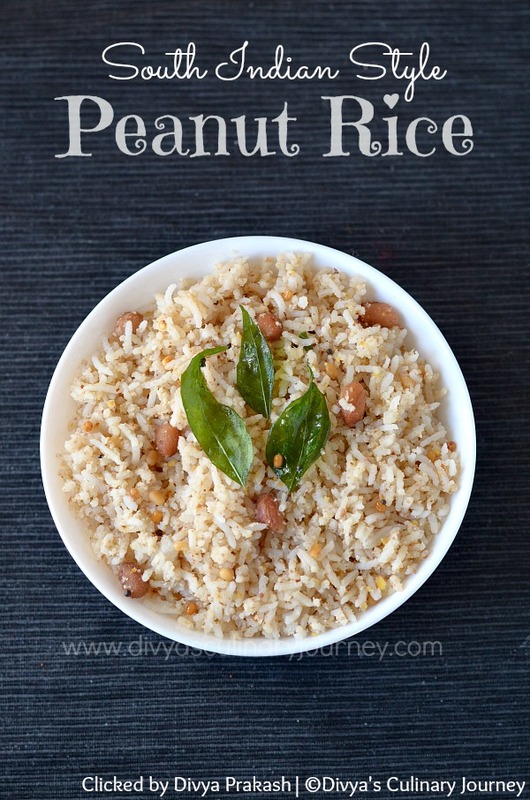 This is one of the easy to make variety rice recipes that can be prepared in a jiffy. This is perfect for packing lunch. 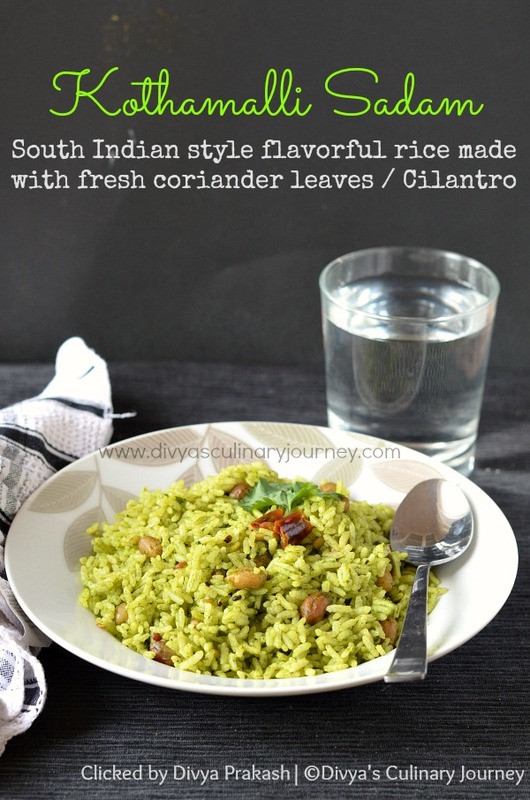 If you love the flavor of cilantro, then you will definitely love this cilantro rice. This has a very attractive color too. In this recipe I have also not used onion and garlic. So if this rice has to be prepared for any festival, as offering to God, then it can be prepared as-is. There are two methods of preparing this rice - one method is to prepare the cilantro mixture and cook rice along with it. The other method is to prepare the cilantro mixture and then mix the cooked rice with it. We follow the latter method. It is called Kalandha Sadam (கலந்த சாதம்) in Tamil, which means Mixed Rice. Today I am here with beetroot Paratha recipe. This is a spicy flatbread made with shredded beets. 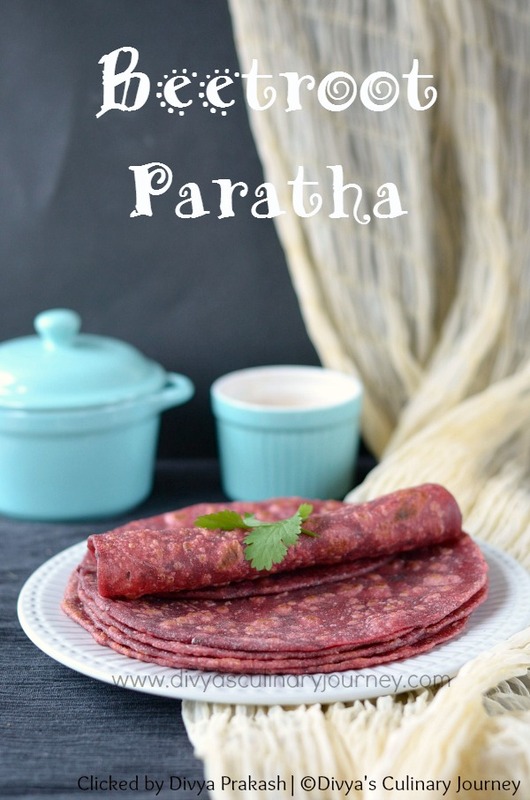 Unlike the other parathas where the spicy filling is stuffed in the centre and then the parathas are rolled and cooked, here in this paratha, the spicy filling is mixed with the dough, then rolled and cooked. Thus it is easy and the beets give a beautiful color to the paratha making it look attractive for the kids. My kids called it 'Pink Chappathi' and though my daughter was happy about it, my son refused to eat it saying pink is for girls and asked me to make chappathi in blue (I am really not sure from what I can get the blue colour). Then I had to explain him that it is made with a vegetable called beetroot which give that color to the parathas and also it is very healthy. He was then convinced and happily had those parathas. Today I am here with Strawberry Yogurt Cake made with fresh Strawberries. This cake is so soft and moist and the lemon icing drizzled on the cake perfectly complements the flavor and makes it even more delicious. I have already mentioned in my earlier posts that my kids love strawberries, so we get it very often. Though they enjoy eating it as is, I love to experiment various recipes with it. You can find the Recipe collection with Strawberries here. 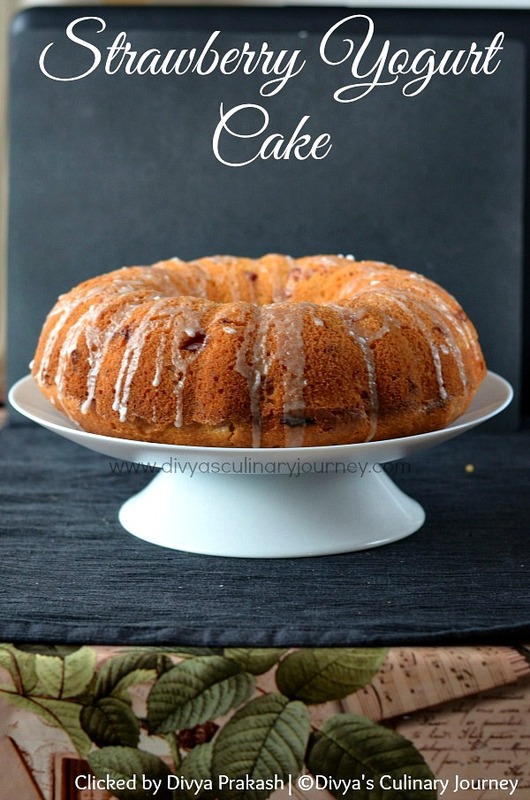 I was searching in google recently for cake recipes with strawberries and came across this recipe and as soon as I saw it, I definitely wanted to give it a try and I am glad that I did. The cake came out so well and my family enjoyed the cake. We had it as dessert and also for breakfast the next day. It is also perfect with a cup of tea. If you love strawberries, then you must definitely give this cake a try and am sure you will love it just like we did. Today I am here with Kesar Peda recipe - Saffron flavored milk fudge. 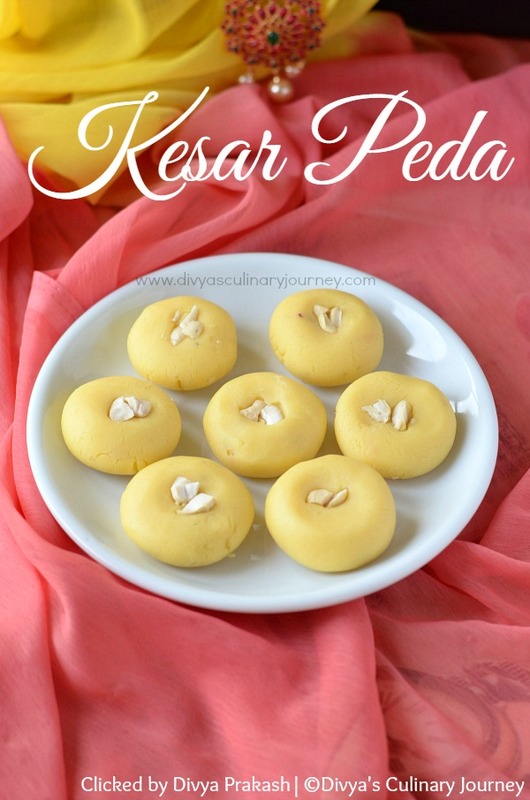 This is an easy recipe to prepare kesar peda in few minutes using milk powder and heavy cream. When I came across this recipe, I really wanted to give it a try. I tried it today and it was easy to make and it came out really well. Kids really loved this peda. If you are looking for an easy recipe for diwali or for party or for any special occasion, you can try this rich dessert and am sure everyone will love it.